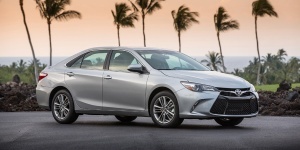 For 2017, the Toyota Camry XLE and XSE receive Entune Audio Plus with Connected Navigation App and JBL Audio. XLE, XSE four-cylinder and XLE Hybrid also receive Qi Wireless Smartphone Charging for compatible phones. Find the used Toyota Camry of your choice from a dealer in your area. Search our used car listings now.